With the calendar turning to April this week, the Q1 2019 earnings season is not far behind. Major companies from the S&P 500 will report earnings in mid-April and results will continue to flow for several weeks. CNBC notes that the outlook is anything but encouraging, even after the S&P 500 Index finished the first quarter with a gain of 13.1%—the best performance for the quarter since 1998, according to Barron’s. 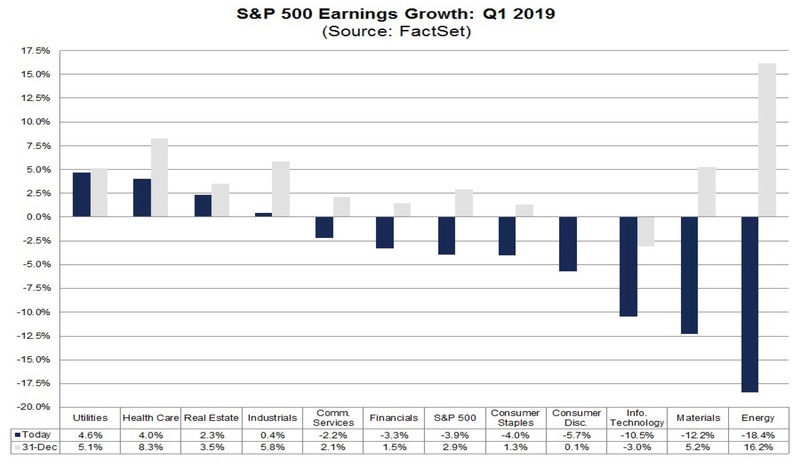 “Earnings Growth: For Q1 2019, the estimated earnings decline for the S&P 500 is -3.9%. If -3.9% is the actual decline for the quarter, it will mark the first year-over-year decline in earnings for the index since Q2 2016. “Earnings Revisions: On December 31, the estimated earnings growth rate for Q1 2019 was 2.9%. 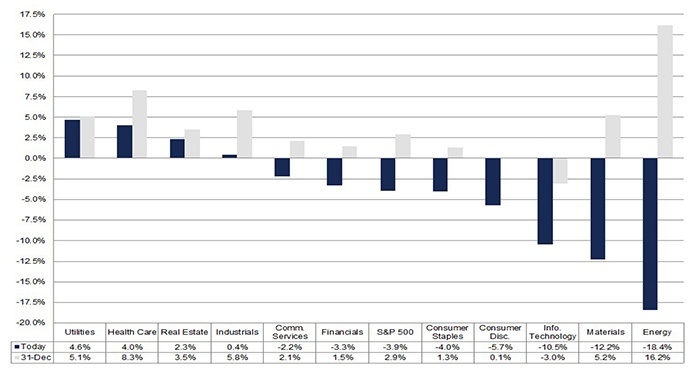 All eleven sectors have lower growth rates today (compared to December 31) due to downward revisions to EPS estimates. “Earnings Guidance: For Q1 2019, 79 S&P 500 companies have issued negative EPS guidance and 28 S&P 500 companies have issued positive EPS guidance. 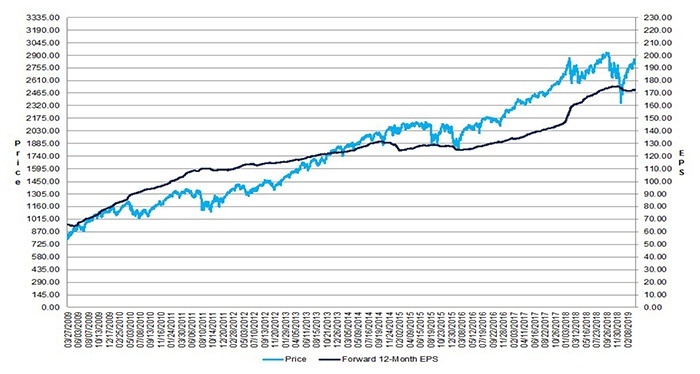 “Valuation: The forward 12-month P/E ratio for the S&P 500 is 16.3. This P/E ratio is below the 5-year average (16.4) but above the 10-year average (14.7). 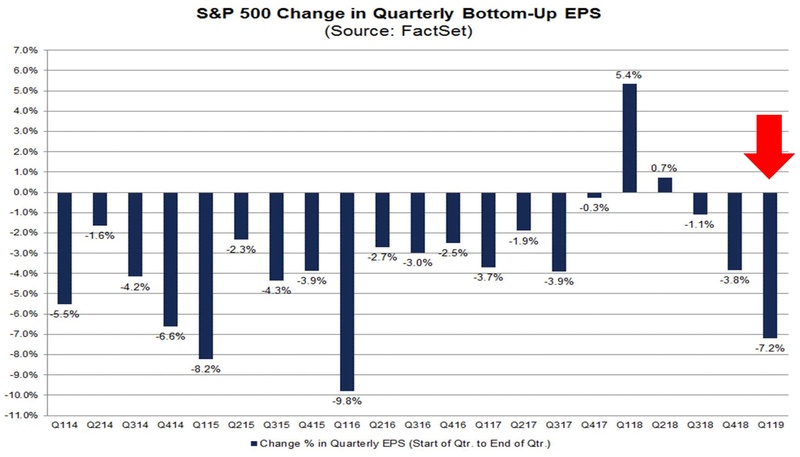 FactSet also notes that analysts lowered Q1 earnings estimates over the past three months for companies in the S&P 500. 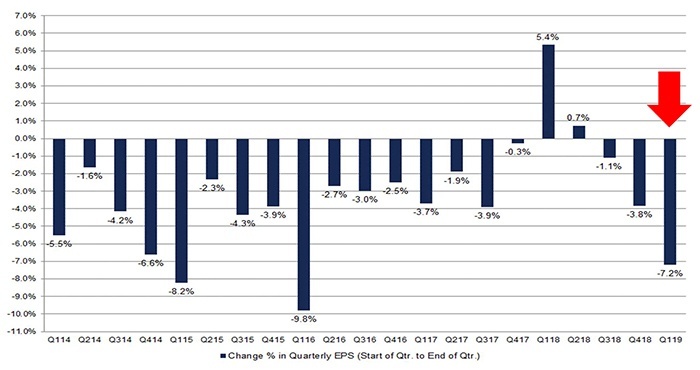 The Q1 EPS estimate dropped by 7.2% (to $37.33 from $40.21), which they say is the largest such drop since Q1 2016. 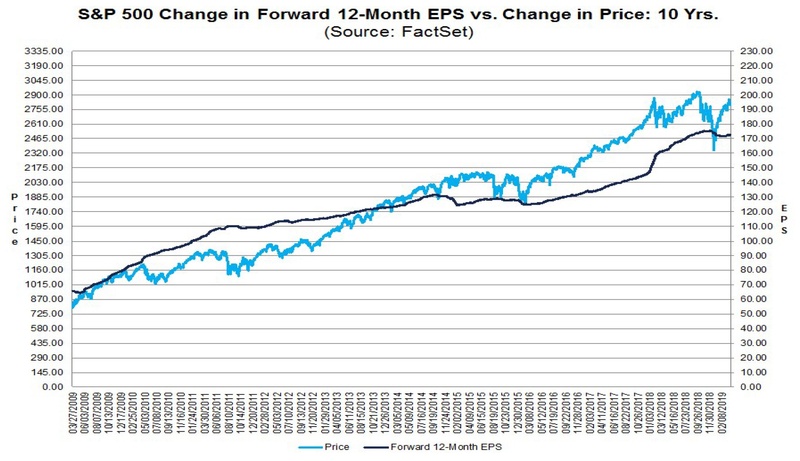 However, it should be noted, according to FactSet, that this will be “the 15th time in the past 20 quarters in which the bottom-up EPS estimate decreased while the value of the index increased during a quarter.” And FactSet notes that the consensus among analysts, on a bottom-up basis, is for the S&P 500 to continue to show price gains over the next 12 months—in the area of +10%. Only four sectors are currently projected to have positive year-over-year earnings growth: Utilities, Health Care, Real Estate, and, just barely, Industrials. The sectors projected to show the weakest comparative growth rates are Information Technology, Materials, and Energy—all with double-digit declines.